I'm a big fan of (Canadian) Thanksgiving - it's the best meal of the year. Whenever I find myself living overseas when the holiday arrives, I make an effort to have a really good dinner. 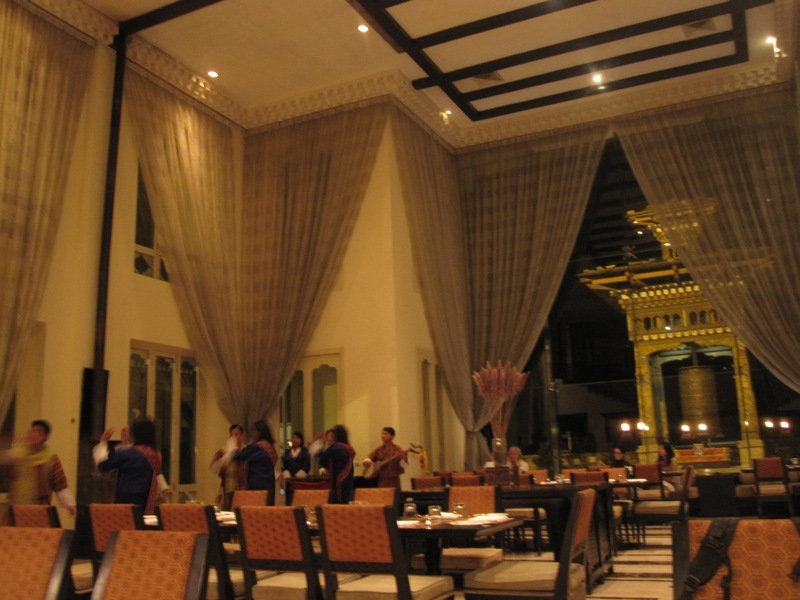 I confess to a slight weariness with the homogeneous flavours of canteen-style Bhutanese food at this point so I decided to treat myself to fine dining at the Taj Tashi, the biggest hotel in Bhutan and the fanciest cuisine in town. The over-sized Taj looms over Thimphu city - it's totally ostentatious and yet... I was drawn in. My parents are believers in the practice of treating yourself to a very special meal now and again without feeling guilty about it and I follow this philosophy, too. However, after I made my reservation at the Taj, I started to feel ashamed for wanting to spend so much money on one meal in a developing country. Shouldn't I just donate the equivalent and be satisfied with another 50¢ momo platter for my Thanksgiving dinner? I expressed these sentiments to a friend here and he told me I needed to get over my "white woman's burden" and enjoy myself. So I did. Here I am on the Taj's dragon carpet in my new green brocade jacket. Hungry! A musical troupe which outnumbered the diners arrived and performed a little longer than necessary. I felt awkward drinking my Druk 1100 beer while the masked dancers spun through a religious rite. The starters arrived: spinach carbonara gnocchi which made me extremely happy and spring rolls which were soggy. The closest thing to turkey on the menu was roasted duck breast. I was looking forward to this dish but the duck was too tough. 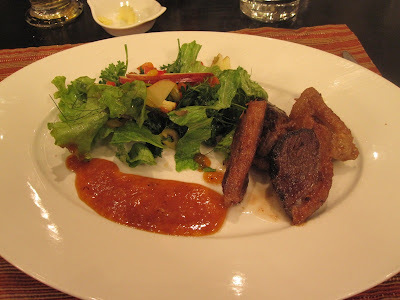 Usually, I like the texture of duck very much but this wasn't what I was hoping for. Nice flavour but the meat needed to be more tender or sliced more carefully. My anonymous date overcame his sticker-shock to try the Thai fish entree which was a winner. 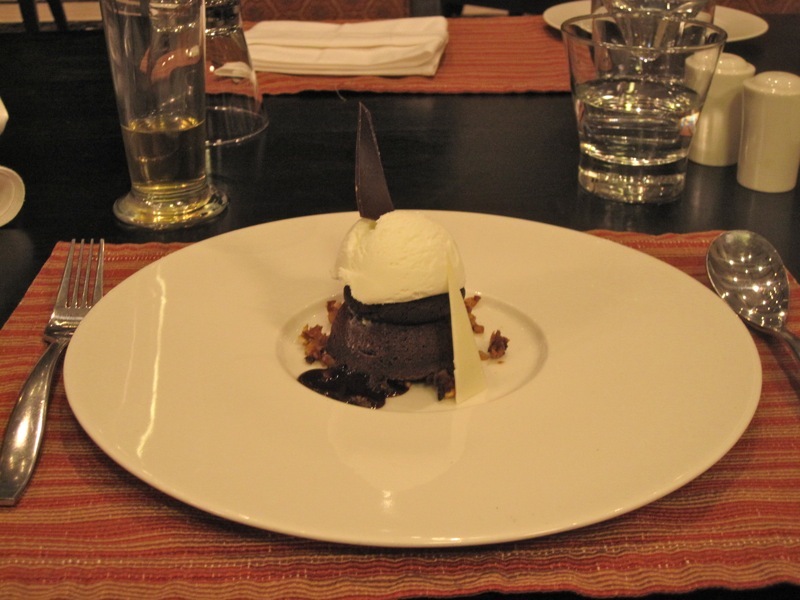 The meal was saved by the fantastic warm chocolate cake. If I go to the Taj again for a meal, I'll just have the gnocchi and cake. 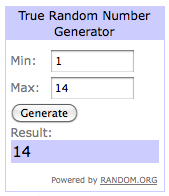 Also, congratulations to Galipette who was commenter #14 on my giveaway post! Watch your mail box for a package, but not too soon because mail is slow to reach the outside world from here. i won? really?! i never win anything! WHEEE! thank you! Happy Thanksgiving! I like the idea of Thanksgiving day, we do have such occasion, only known by different names. I feel sorry about your Taj experience. Ha ha ha. 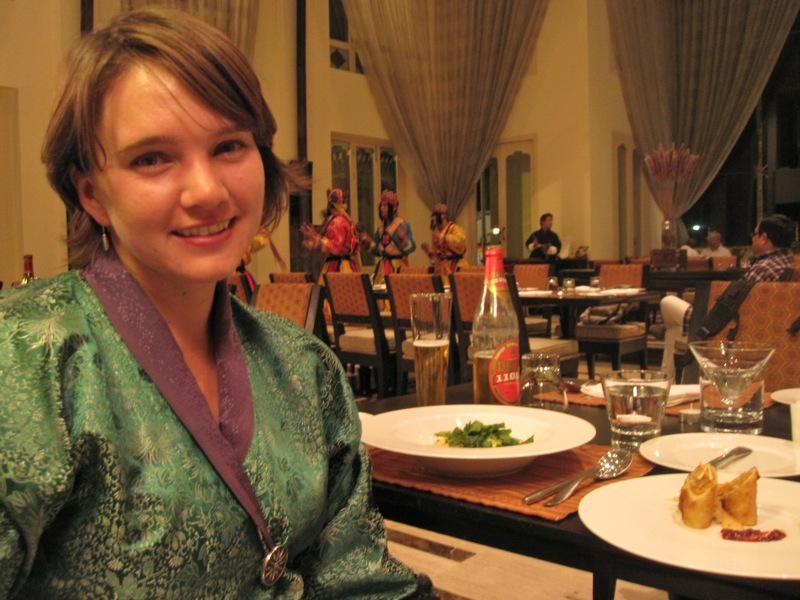 Why did you go to a Bhutanese hotel to experience western food at all? They are only imitating- sometimes failing to do just that. I am not happy with your Random number picker, I think it was finding the sum total of comments rather than picking a number. I should have commented at the end! lol. Anyway COngrats galipette. And yes, the random result of 14 does seem like I made a mistake with the number generator widget but I tested it a few times afterwards to be sure and yes, that was a random result. I am bound to take the first number shown as the winner! Sorry PaSsu! But I'll take you out for lunch if you're in the big city anytime soon. 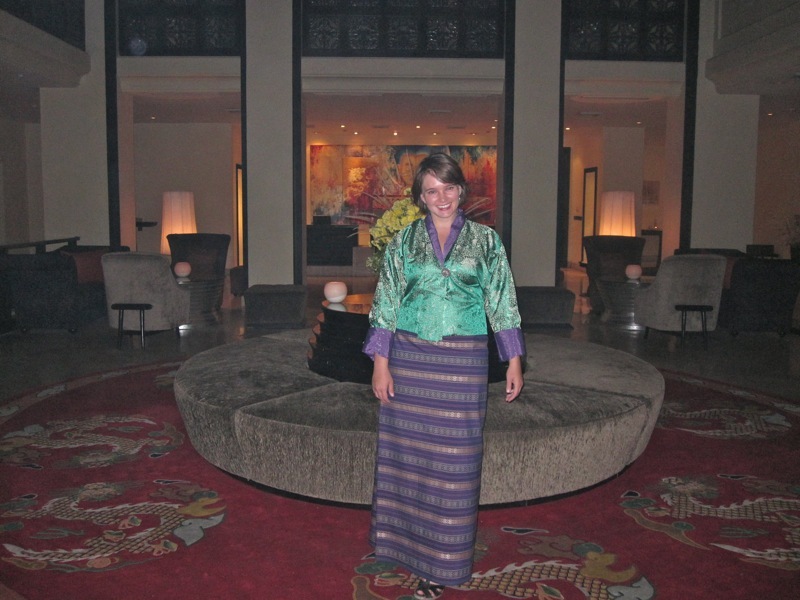 As for why I went to a Bhutanese hotel for western food... I thought it was an Indian hotel, actually, and the chef I saw seemed to be Indian. They make a good chocolate cake, anyway.